Taylor Farms Broccoli Salads recalled for listeria risk. Details here. As an alternative to pre-made broccoli salad, I suggest a nice head of fresh broccoli prepared in one of these super yum ways. Eat well, be well. I’ve shared with you my serious leaning toward the burger as a warm, satisfying handheld meal. My experiments in veggie burgering are many and I’ve enjoyed every one; however, there are only so many warm satisfying handheld meals one can consume in a single week (this is what I’ve inferred from my crew, mind you, not my own opinion). Far be it from me, however, to simply leave the flavors of my beloved veggie burgers behind. 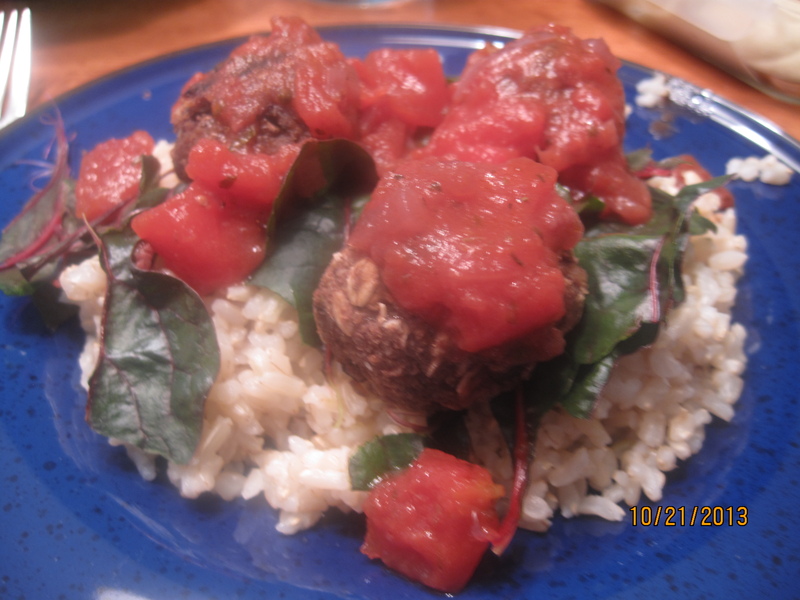 What better way to get the flavor I’m looking for and make it LOOK like I was inventing a whole new meal just for my little one’s picky little palate than to make veggie burger neatballs? How awesome am I? And neatballs? Small, yummy, cute, warm. What picky pantser could possibly resist? Not when there are so many other things you could do with it. Seriously. So my poor son faces every Halloween knowing there will be a time limit after which the remaining candy gets thrown out. He does not over indulge except for the first night so we always end up throwing quite a bit away. However, the presence and consumption of candy resets the bar for what constitutes a treat, or dessert. I hate when the bar gets reset. It takes a lot longer to get that bar inched upwards than it does to knock the sucker right off of it’s holder! This year we may participate in our local dentist’s Candy Buy Back. The sign says they are buying Halloween candy on November 1st and 2nd. I don’t know if they are sending the candy to the troops or not, but “Operation Gratitude of the CA Army National Guard” accepts candy donations from dentists collected in buy backs and sends it overseas to the troops. It’s a twist on a nutrition minded Robin Hood – take the candy from the most physically vulnerable and send it to grown ups instead 😉 A nice program all around, don’t you think, especially for the men and women overseas who are away from family and tradition. 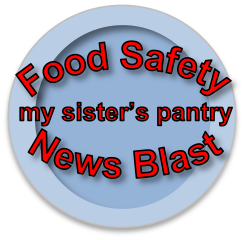 How about a read the label contest? If you can’t pronounce something on the label then you don’t get to eat it? Okay, okay -that one is mean. Plus the ‘fun size’ little bits that come in big bags are probably not individually labelled. Although it wouldn’t hurt to look up some ingredients on-line. Most companies have their ingredient lists at websites and from there you can check to see what ingredients are found on the Center for Science in the Public Interest’s lists of food to avoid and cut back on. 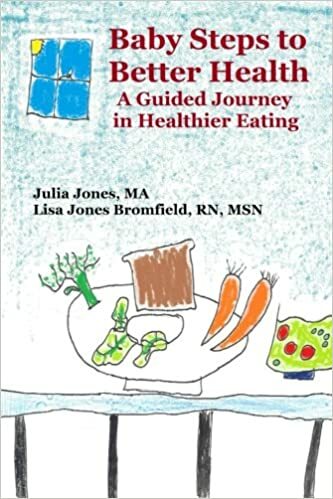 You will of course find lots of varieties of sugar and also probably some caramel color and food color which are outlawed in Europe because of evidence of bad effects on health. You can run some science experiments in the backyard if you have no pets. Place some unwrapped candy outside and see if any creatures will eat it – and see what types of candy last the longest out there. Some might make it til Spring. Does that make you want to eat it? Ever notice there are no expiration dates on candy? You can do a ‘science experiment’ in the kitchen where you melt a variety of candy in one big pot just to watch the colors and textures swirl around before throwing it away. You could also do your own buyback where you offer special activities, art supplies, or special time with Mom and/or Dad in exchange for coughing up the sweet goods. And what about poisoning the neighborhood children? Well…. 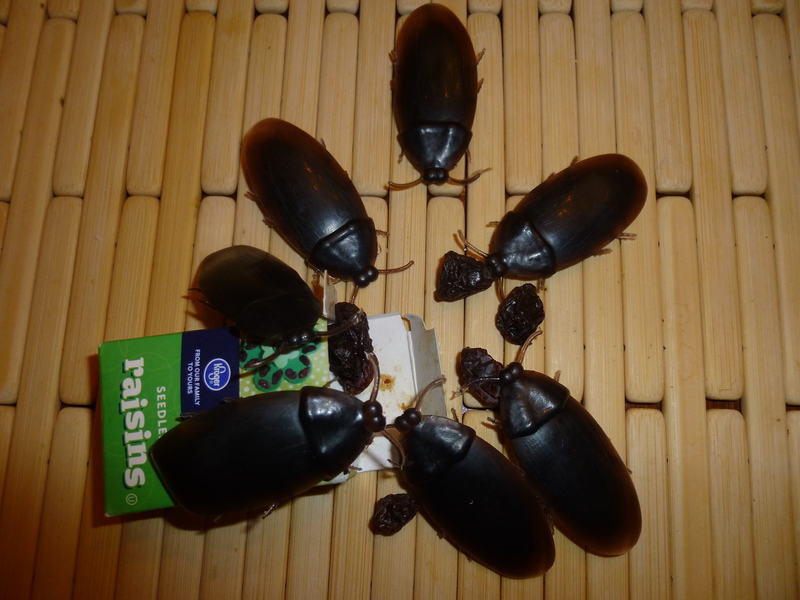 this year I am giving away fake, plastic roaches, because who doesn’t need one or two of those?, as well as boxes of raisins, AND I will have one bowl of candy reserved for the older kids because I do not wish to spend November 1st picking toilet paper out of the trees. Last year it was plastic spiders and a good many of the older kids opted for spiders over candy…. after all they were getting that everywhere else! And lastly, emphasize all of the other non-candy elements of the holiday. Enjoy carving pumpkins, drinking special teas or a little hot cider, decorating your yard or house, making or planning costumes, walking around the neighborhood together and telling Halloween jokes…..
What did one casket say to the other?…………………..Is that you coffin? A few weeks ago I started slipping ’em low sugar graham crackers – really pretty harmless and something they enjoy. No problem. After a while of that they requested something else – anything else (and who can blame them). I found myself wandering through the prepared treats aisle reading packages of corn syrup laden white flour options as though I had never once baked in my own kitchen. I practically forgot that I used to spend a few minutes just about every weekend assembling a treat that would satisfy both the kids and me. I would bake for our customary Sunday dessert and then serve the rest throughout the week in small lunch sized portions. When I brought home cookies previously deemed pretty wholesome without even reading the label, ate one and felt a film in my mouth and had to stop because it was too sweet to enjoy, I knew I’d hit the proverbial bottom. 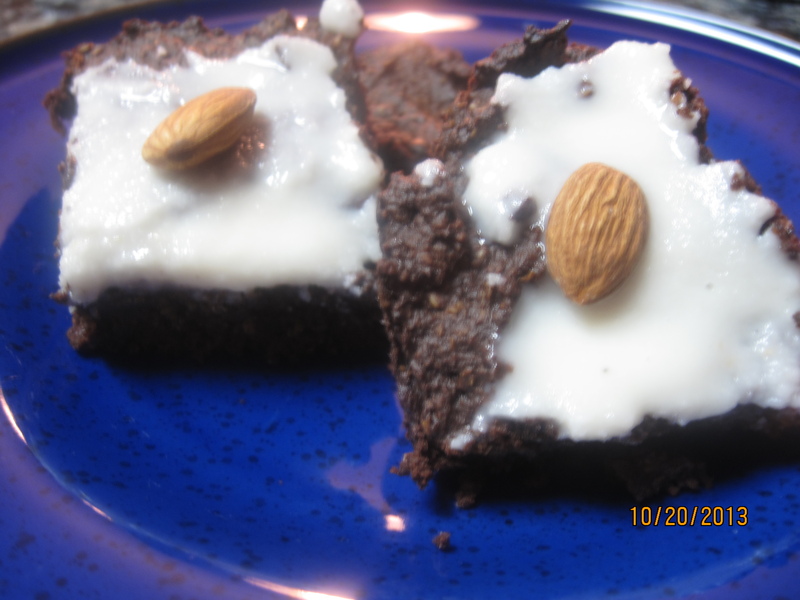 Which is great, because it led me to spending a little time today making my new favorite dessert, Almond Joy Brownies. Preheat Oven to 350. 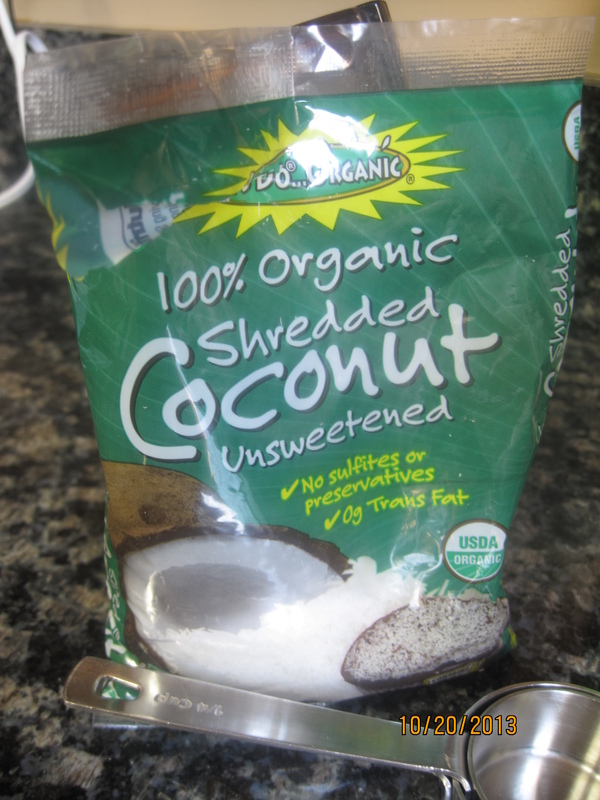 Melt coconut oil and add cocoa, stirring to create smooth, silky chocolate that you should not eat. Combine oat flour, baking powder and salt in small bowl. 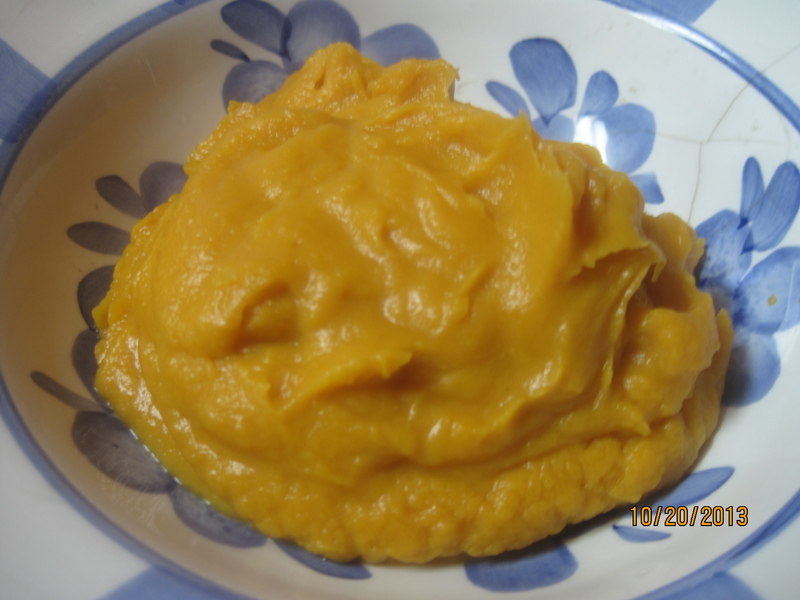 Combine coconut sugar, sweet potato puree, flax egg and vanilla in medium or larger bowl and whisk until smooth. Add chocolate. Stir to combine. 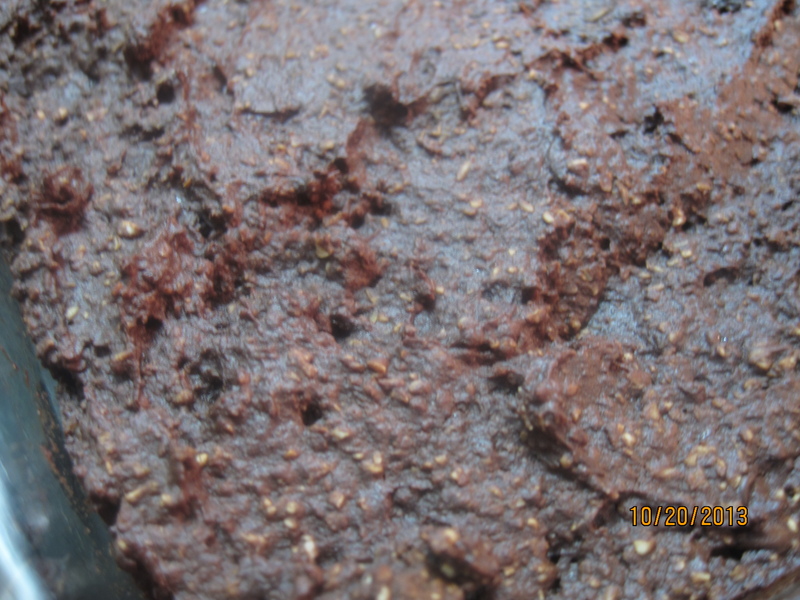 Add dry ingredients (if you’re still holding a whisk, now is the time to switch to a spoon, unless you’re trying to create an “Oh no, I have so much brownie batter stuck in my whisk, however will I get it off…. slurp” kind of scenario. Not that I’ve ever done that. 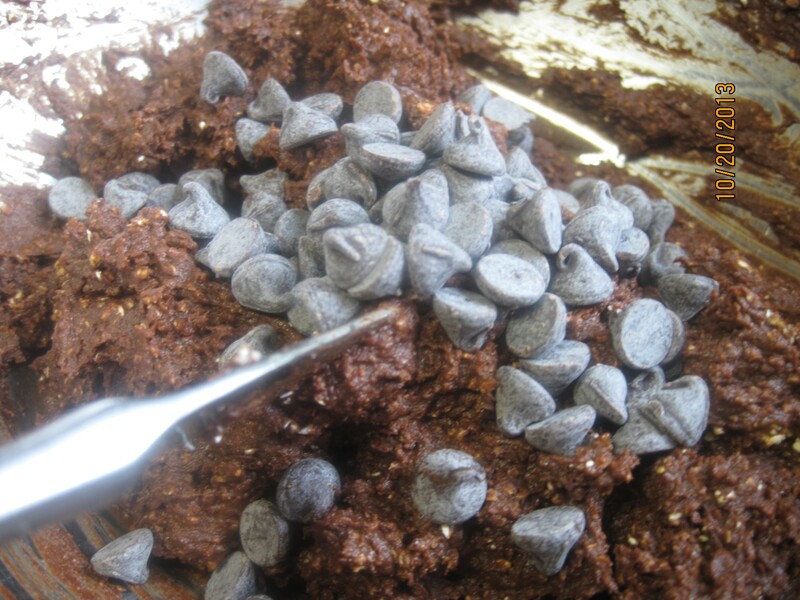 Add a handful or so of your favorite chocolate chips. Scoop into oiled square baking dish. Bake for 35-40 minutes. Look for typical brownie crackling on top and a slightly firm feel in the middle of the pan (that second test is only for those of us in the asbestos fingers crowd). You can try the toothpick test, but these are fudgy, and will not likely come out totally clean. So just look for not wet, mostly clean. Remove and allow to cool in the pan. 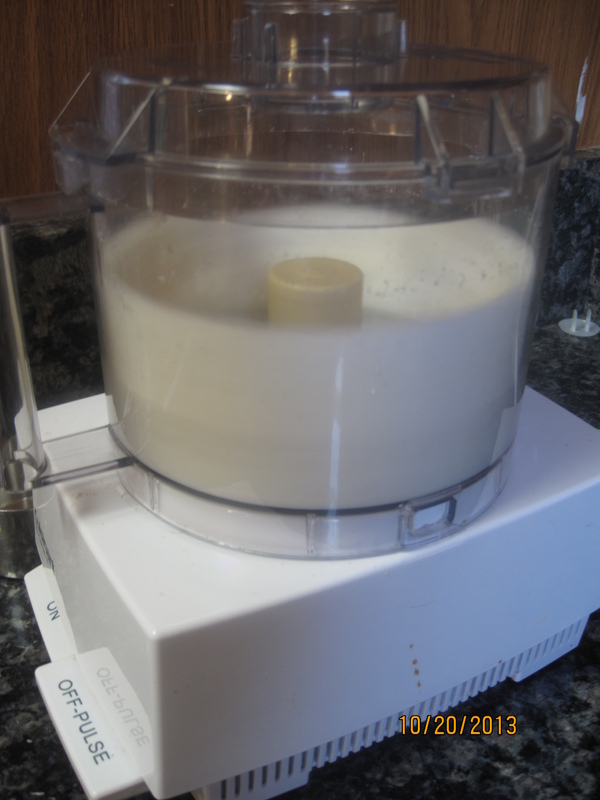 Place coconut in food processor. Turn on and let it run, run, run. You’re going to let it go so long that the coconut is going to turn into a liquid. You’ll want to stop it occasionally and scrape the sides of the bowl so all of the coconut gets transformed into superific coconut butter. When the contents of the bowl are shiny, let it run a couple more minutes and then place in a container you can put a lid on so you can save the leftover and put it on your toast, in your oatmeal…. yes, the options are mind-boggling.. So when the brownies have cooled a little (you don’t have to let them cool completely), spread the coconut butter on top in whatever amount makes sense to you. I tried to show a little restraint because I wanted to chocolate flavor to prevail. 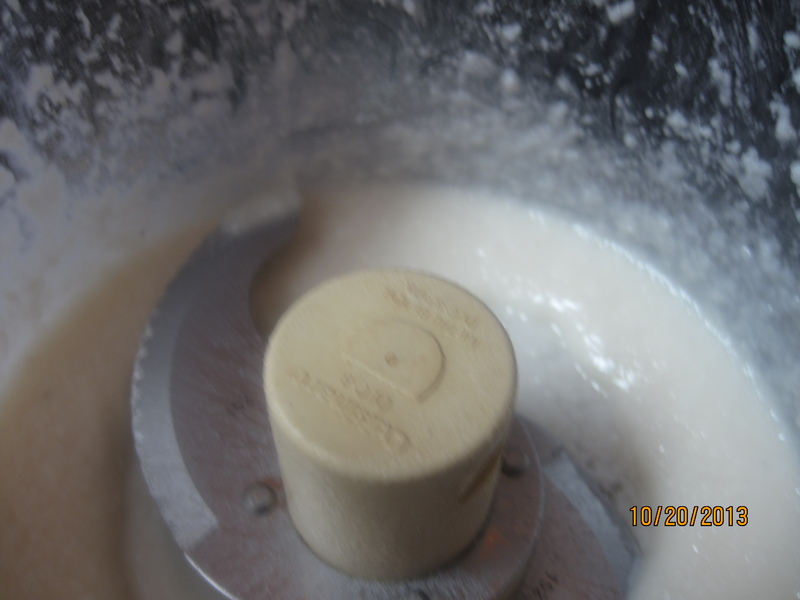 If your coconut butter has hardened, gently warm it a little to soften. 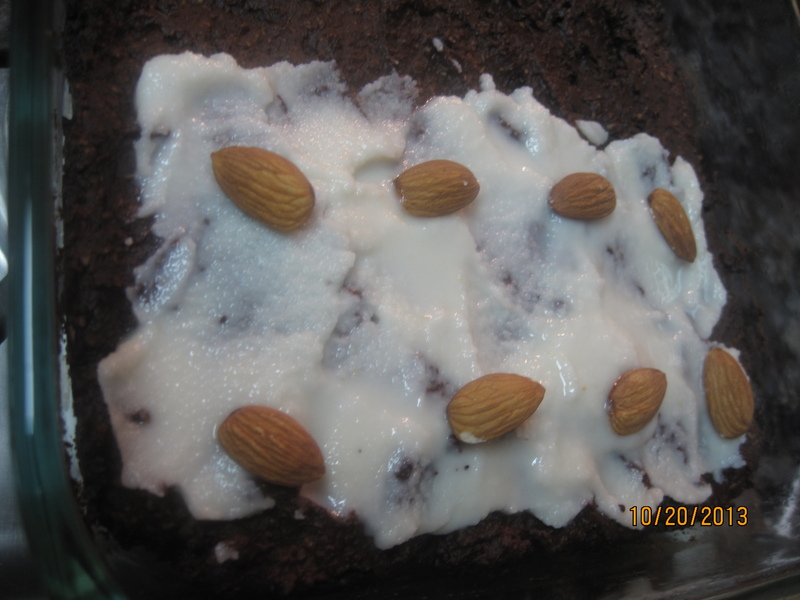 Place almonds on top – I did a one whole almond per brownie ratio, to get that crunch that I used to love in the Almond Joy, but I think chopped almonds would make for a nice effect as well. I don’t think I even need to tell you that these were great – what’s not to love? 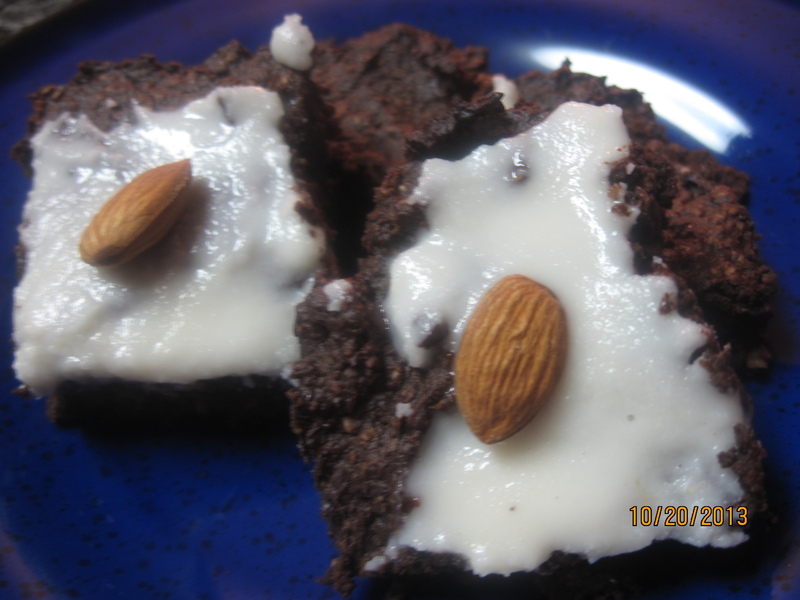 Super dark chocolate flavor, coconut creaminess and that wholesome crunchy almond. Delish. And now I’m ready for those lunch boxes for real. Apparently I’ve missed a few recalls. E Coli in organic ground beef details. Salmonella in Costco rotisserie chicken details. Ready to Eat chicken and ham deli products details. Check your fridge; check your freezer. Tell you friends. Eat well, be well. I CANNOT believe I’ve not shared these burgers with you. They are an absolute favorite of mine and they are Ms. Picky Pants’ favorite veggie burger. If THAT isn’t a recommendation, I don’t know what is. I came across the recipe a few years ago in The Washington Post, and after quite a bit of experimentation, we’ve found the version of their version (ha) that appeals most to us. If you’re a fan of Lynne Rosetto Kasper (of American Public Media’s The Splendid Table fame), you should know she has also claimed a version of these as HER personal favorite veggie burger. If you’re not yet impressed I’ll go out and fine some more people who love them… okay, you’re right I won’t. You should just give them a try. You know how we feel about lentils around here… OR, if you’re new and you don’t, I’d like to send you here first before you then do a search on lentils and see how ridiculously fond we are of this little protein and fiber packed cheap meal makin’ legume. Lately our weather has been driving my food cravings and after our recent spate of unseasonably warm weather (leading to Cold Sesame Noodle perfection), we’ve had a predictably unpredictable Mid-Atlantic weather shift to slightly cooler than average with rain – lots and lots of rain. Not much better remedy for wet and damp days than soup. 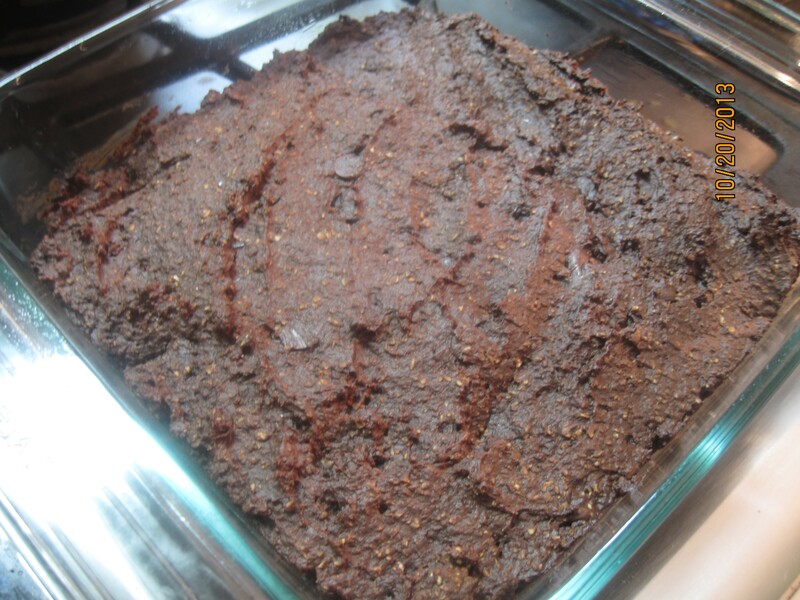 Easier Chocolate Almond Butter & a Winner! A lot of info to share so I’ve combined the bell peppers and chicken in one post. Reported illnesses in the case of the chicken. Blech. Eat well, be well friends.